When Chele announced that this month we were to make something suitable for the We Should Cocoa first birthday party, I knew exactly what I wanted to do. I’d been eyeing up Pam Corbin’s Chocolate Cake recipe since I first acquired her excellent book Cakes (no 8 in the River Cottage Handbook series). I was intrigued by her use of drinking chocolate powder in the recipe. It seemed like a perfect opportunity to use the Steenbergs chilli drinking chocolate that I’ve been trying not to drink too greedily. I was hoping this would give a very mild chilli effect with just a trace of warmth. So, all that was needed was the excuse of a friend coming to tea and I set to with a will. Apart from using the chilli drinking chocolate, I followed the recipe pretty much as written for the actual cake. But the filling and topping I changed. Amazingly, I still had some apricot curd in the fridge, but it really did need using up and I thought this would provide a nice contrast to the chocolate. For the top, I was inspired by a Hugh Fernely Whitingstall recipe from the Guardian that our friend had given me. It was for a wicked looking chocolate hazelnut cake that I will have to make one day. The Ganache was a little different and was meant to give a glossy top, so I thought I’d do something similar. Stirred 50 hot water into 25g chilli drinking chocolate and 25g cocoa until smooth. Creamed 175g unsalted butter with 100g cardamom sugar and 100g light brown muscavado sugar until light and fluffy. Beat the cocoa mixture and a pinch of Himalayan pink rock salt into the butter mixture. Sieved 200g flour (half spelt, half white), 1 tsp baking powder and 1 tsp bicarb of soda. Beat in 4 large eggs one at a time, mixing in a tbsp of flour after each one to prevent curdling. Stirred in the remaining flour. Added 75g fat free Greek yogurt and 75ml milk and mixed gently. Spooned into two 22 cm cake moulds and baked at 180C for 35 mins. Removed and left to cool. Sandwiched together with apricot curd buttercream made with 50g unsalted butter, 100g icing sugar and 3 heaped tbsp apricot curd. Dissolved 50g vanilla sugar in 50ml water and boiled for 3 mins. Allowed to cool to warm rather than hot. Added 80g broken dark chocolate (85%) and 10g unsalted butter. Grated 20g dark chocolate (85%) and scattered over the top. This was a wonderfully moist cake, perfectly cooked and risen. It was also surprisingly fragrant courtesy of the cardamom sugar. I’m guessing that as I’d been away for a while the cardamom pods in the sugar had time to do their work without being interrupted by me. The apricot filling provided a nice contrast to the chocolate. I was really pleased with the glossy chocolate top which set firmly and dribbled elegantly down the sides without gushing all over the plate. It tasted good too, a nice chocolate hit to a cake which wasn’t particularly chocolatey. The chilli worked just as I hoped it would and was a hint rather than an assault. It added a depth to the flavour and left a very faint tingle in the mouth and throat. All in all a worthy offering for our first birthday party. It does look very good. I like the idea of mixing the chilli chocolate with the cardamom sugar (could we call it a curry cake?) and then the ganache and the apricot curd. Fantastic combinations. I am drooling (again!). Wow! Looks and sounds amazing, I love the combination of chilli and chocolate. A delicious cake for an excellent project. This looks perfect!troneel We love chilli in chocolate cakes, and I’ve made a note of the topping too, as it looks very useful! It looks a perfect celebratory cake! I’m still convinced by the choc/chilli combo but this cake may do just that! That looks sooo very good!! That is a PERFECT cake and the slice is beautifully photographed too! Chilli and Chocolate are favourite combos for me. What a beautiful and decadent chocolate cake! What a lovely BIG chocolate cake. Excellent rise and glossy icing, this is going to be a very good party! Love the sound of that flavour combination. Definitely the cake for a celebration. Perrrrfection Choclette. Couldn’t look better! That looks so good! Love the idea of adding just a touch of chilli and the glaze looks gorgeous. Great idea to use the apricot curs, chocolaty, sweet, spices and fruity all in one! Kath – ha ha, but absolutely NOT a curry cake. Although bringing some curry along to the party might be an idea. Susan – would rather you ate it than murder it, but if that’s what you prefer …..! Rhizowen – glad you approve. Suelle – chilli and chocolate are a great classic pairing. The topping is really good and easy to do. I’ll be using it again. MCB – sometimes odd combinations just work and this is one of them. Botanical Baker – thank you. Anna – ah, thank you. Karen – you’re certainly a girl after my own heart when it comes to flavour combinations. And thank you for saying nice things for my inept photography. The angle of the slice is very strange! Janice – thank you. I think it’s going to be an excellent party – can’t wait! Phil – like yours this is possibly one for the adults rather than the the one year olds. Katie – good point, hadn’t thought of it as an all round cake. Lucie – thank you, nice to hear from you. Love the idea of the drinking chocolate and that icing looks just perfect. Wow, that looks like such a delicious cake – so moist and chocolatey and gorgeous…. What a lovely cake, I love chilli chocolate. Johanna – I don’t think I ever got the sort of birthday cake I wanted either – mine were always a bit too wholesome! C – ha ha, I think this was my first case of perfect drips! Choclette – this is my idea of the perfect cake – I so wish I could have a huge slice!!!! This looks absolutely divine! I made chocolate cake with cardamom recently and it’s so good…can imagine the apricot really complements those flavours too. Hugh F-W recipes always come out wonderfully, but I love how you’ve made this your own. Thanks for visiting my blog. 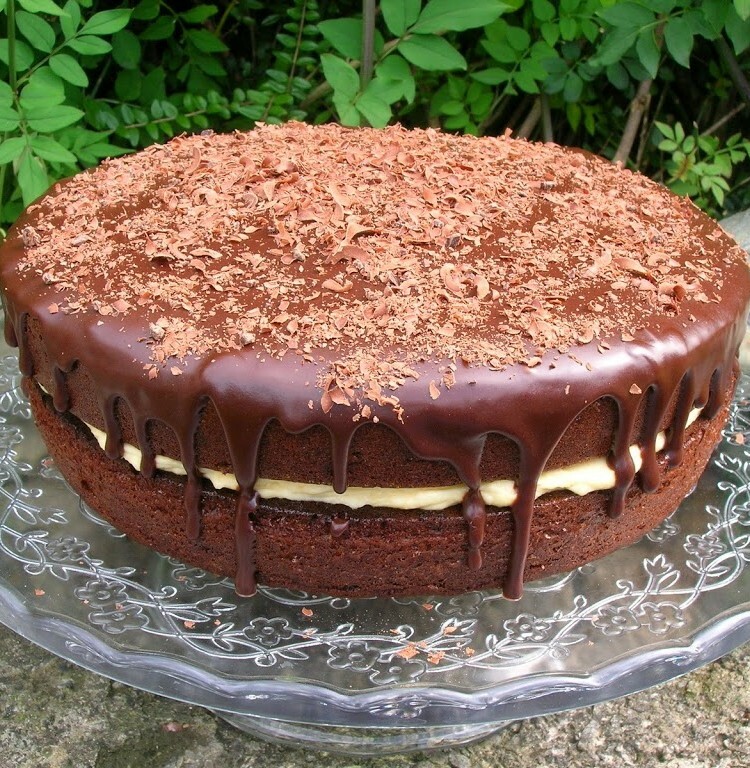 I have been thinking about making a chocolate chilli cake for a while now and this looks yum! BVG – I’ll try and save you a slice too! Little Loaf – thank you. Cardamom and chocolate make a fabulous pairing – I bet your cake was delicious. Cake Fairy – love chilli and chocolate – the oldest combination of all. Now that’s my kind of cake…. Nic – Glad you’re another chilli fan. I have not tried chilli chocolate yet and wouldn’t dare do a cake without trying it first. I’ll have to get a sample today as I’m off shopping in town. Thanks Lorraine. With all the cakes I’ve made, in terms of looks, this is probably my favourite. It tasted rather good too.